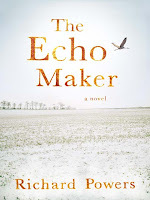 I was trawling through the New York Times book reviews, looking for something to read, when I came across their review of The Echo Maker by Richard Powers, which won the National Book Award and was a Pulitzer finalist. It's a novel that deals with neuroscience, family, and Sandhill Cranes. I couldn't believe I'd never heard of it before. What caused the accident, no one can say — the only witnesses are the sandhill cranes, half a million of them, who stop outside Kearney each year on their migratory journey. Ancient and silent, the birds “dance as they have since before this river started,” re-enacting their hard-wired ritual of departure and homecoming. That Powers will use these denizens of the natural world as feathered avatars of his human characters is a given; that he is able to tease out surprising resonances is part of his gift. A very illuminating interview with the author about novels, cranes, and the Plains.